A few months ago, while I was selling off some old bike items to finance some new rides for Ian and I, my neighbor gave me two old bikes collecting dust in his garage. One of 'em being a nice old school Giant mountain bike, complete with XT group and rigid fork. Bike was clean, but sporting a huge frame - around a 21" seat tube. I immediately thought of my old pal John, back east, who earlier emailed about creating a utility bike for daily use. A deal was struck, bike boxed up, and sent to the DC area for it's new life. 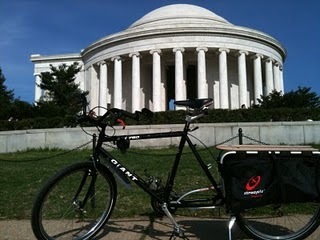 John did complete the project, installing a Xtracycle kit to the old Giant. It came out pretty sweet, a cool useful rig. Pic below as completed. This week I received a pic of John giving his daughter a lift to school on the Xtracycle. That's Mollie hitching a free ride while catching up on some reading. Awesome. John mentioned Mollie now rides her own bike to school. Even more awesome. Eventually Mollie will probably be hauling the old man around the on Xtracycle, having things come full circle. John and I met back in the early '80s while spinning wrenches at Whippany Cycle. John later went on to form Ozone Action - group of folks to point out companies that produce chemicals destroying the ozone layer. After that, a multi-year stint as Executive Director of Greenpeace USA. He's now combining his economics background and environmental expertise to help fund various environmental causes. Super intelligent guy and damn funny as well. I always get a kick out of hearing from him. A Google search on John Passacantando will get you more info my old bike shop pal. Not bad for a bike mechanic from New Jersey. Super cool seeing this old mountain bike get a new lease on life. What a perfect use for it, I think you'd have to agree. The Xtracycle kit is pretty freaking neat. I also dig the wave of complete utility and transportation bikes that have hit the market over the last few years. These are the types of bikes that could bump up bike use for "regular" folk, not just bike enthusiasts. Wear street clothes, buzz down to the store and carry a few bags of groceries home. It just makes too much sense. If I had some extra dough to burn, would build up a utility bike to toy around with. Being ex-motorcycle guy, I'd even mess around with electric assist on the rig. Would be a fun project. For now, a messenger bag and my current pile of bikes work just fine for daily use. Even so, I find the utility style of bike a fascinating addition to the scene and hope to spot more of 'em in use.